"Painter Angelina Gualdoni manages to be a mega-multi-tasker who meets the demands of having a recent solo exhibition, running the collaborative gallery Regina Rex on the Lower East Side, working as an educator at the School of the Museum of Fine Arts, Boston and having a family in Brooklyn – not to mention hunting for morel mushrooms. Her method: DIY. Gualdoni’s fluid, abstract paintings reference the still life in domestic space but are conceptually grounded in issues of labor and feminism. 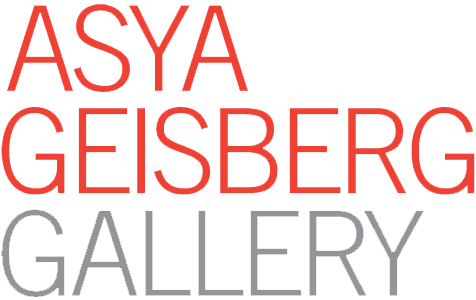 Her recent exhibitions include Asya Geisberg Gallery, NYC; Kavi Gupta Gallery, Chicago; Galerie Jochen Hempel, Leipzig; Queens Museum, NY; Orlando Museum of Art, Florida; Galleria dell’Arco, Palermo, Italy and Shanghai, China; and Museum of Contemporary Art, Chicago, among many others. She has received grants from the New York Foundation for the Arts and Pollock-Krasner Foundation, and has been an artist-in-residence at MacDowell Colony and Chateau La Napoule in France. 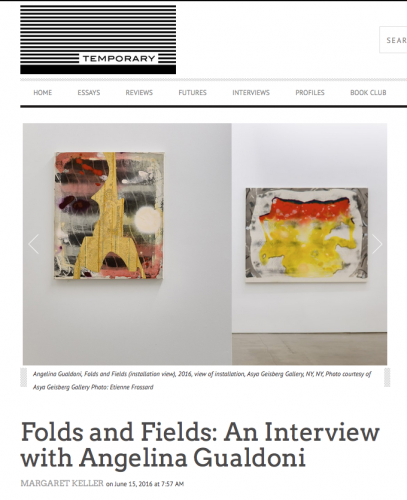 After viewing her most recent exhibit, Folds and Fields, this past March at Asya Geisberg Gallery in Chelsea, I talked with Angelina about the changes and challenges of labor for artists today."